Following this tradition of slit lamp innovation, the BQ 900 LED was introduced in 2010 as the first LED slit lamp in the world. While the LED illumination allows brighter and more homogeneous illumination, the BQ 900 offers many other advantages including excellent optics, versatility and ease of operation. Therefore, it has become the standard slit lamp for those requiring advanced slit lamp microscopy. APPLANATION TONOMETER AT 900 – The original Goldmann tonometer. ZOOM OBJECTIVE – With the zoom objective, the magnification can be continuously changed from 6 up to 40x. Reference points are set at magnifications 10, 16 and 25x to allow easy orientation. INCLINED EYEPIECE ADAPTOR for Ergonomic and fatigue-free working – With the inclined eyepiece adaptor, the view into the microscope is inclined at 20 degrees to the horizontal. examination of the fundus, peripheral parts of the retina and the vitreous, even under unfavourable conditions such as high myopia and small pupils. BEAM SPLITTER – The beam splitter diverts a portion of the light to secondary attachments such as the second observer tube, video or digital cameras. CONTRAST ENHANCING FILTER – Fluorescence enhancement yellow barrier filter provides additional contrast to fluorescein images. The BM 900 has been the standard in modern slit lamp microscopy for more than 55 years and still is! Over 100,000 professionals all over the world who own a BM 900 agree that it was the best investment they ever made for their practice. As with all Haag-Streit slitlamps, a Goldmann tonometer – the gold standard in IOP measurement – may be added to the system. oculars it can be extended to 25× and 40× magnification. Like any other Haag-Streit slit lamp, the BM 900 features the best optical components to show all structures of the human eye in every detail. Ophthalmic Photographer in his demanding profession. 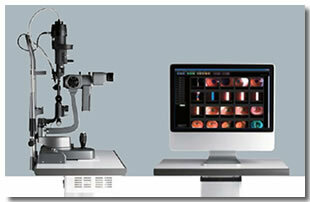 Ophthalmic imaging of the highest possible quality is ensured with an integrated flash, fully synchronised with camera and slit and background illumination, all controlled through a release mechanism directly beside the slit lamp joystick, as well as adaptors for a variety of top-of-the-range digital single lens reflex cameras. The camera is mounted above the microscope, thus allowing ease of access to the patient. This is especially useful when photographing in conjunction with hand-held diagnostic lenses. Xenon flash – The high power flash illumination is delivered via a xenon tube that lies coaxially to the LED illumination and thus exactly reproduces the slit illumination pattern to provide images of stunning quality. The brightness of the flash is individually adjustable for slit and background illumination. Mirror housing – The heart of the BX 900 is the mirror housing with its built-in diaphragms. When capturing an image, all light is directed via a mirror to the camera. This allows the maximum utilisation of the available light: 100% for the examination and 100% for the image. The built-in diaphragm setting with five apertures is applied automatically on image capture. Shutter release – Conveniently mounted close to the operator’s hand, this can easily be utilised whilst continuously maintaining focus with the slit lamp joystick. As it is symmetric on the cross slide, it allows right- and left-handed operation. Advanced optic system, a remarkable difference. information and experience within the market. which make slit lamp imaging more convenient than ever before. We can convert almost all Slitlamps on the market into digital and all of our slitlamps can be delivered with a fully digital system. Elbow rest for use with microscopes, or other kind of examinations where your hands needs to be stay lifted.